Audi has treated its flagship A8 saloon to a facelift for 2014. 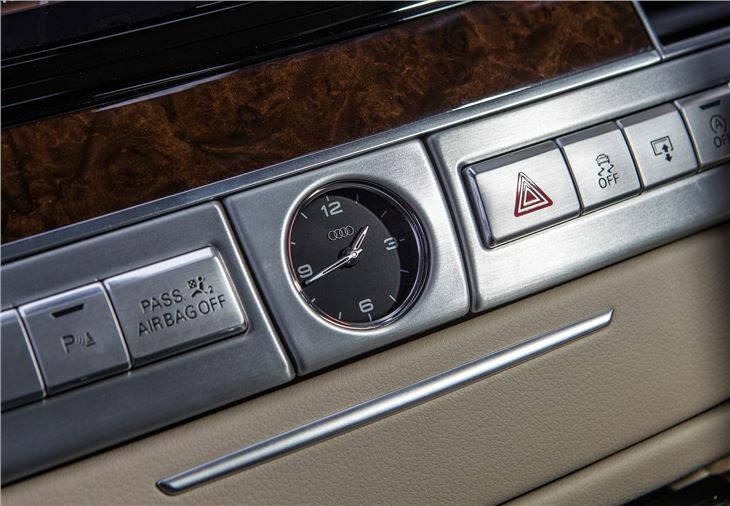 And in what is becoming an Audi trademark, the changes all relate to the bits you can't see. So, as they're so minor, we'll deal with the styling changes first. These boil down some minor revisions to the bumper, bonnet and air intakes at the front, new rear lights and exhaust pipes and fresh alloy wheel designs. 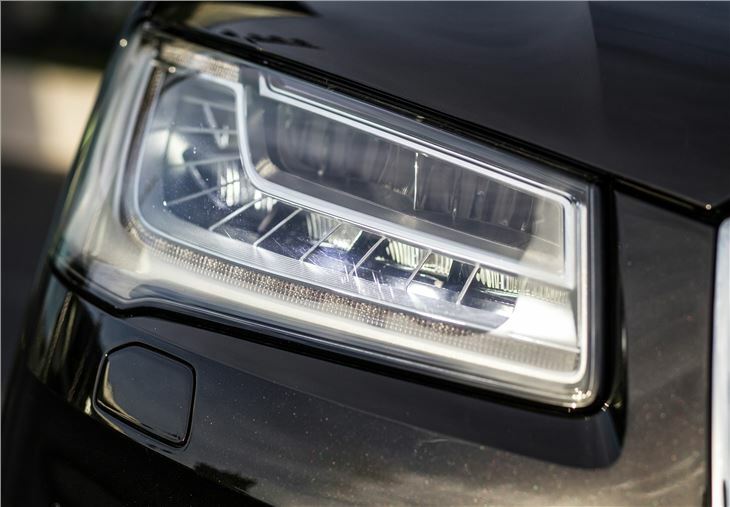 The updated A8's new party piece is an adaptable headlight system which Audi calls “MatrixBeam” headlights. This system uses 25 separate LEDs and scans the road ahead to automatically shut off sections of high beam, to cut down on dazzle, provide light around corners and a ‘flicker’ function to flash a warning signal at pedestrians. 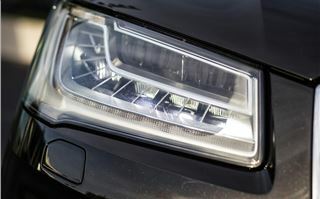 It’s a smart system – assuming those LEDs never fail - and you can expect to see it cascading down the Audi range in the very near future. 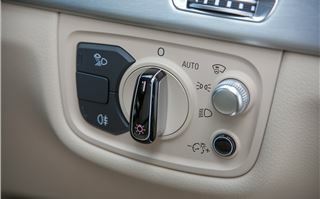 There are similar nips-and-tucks inside. 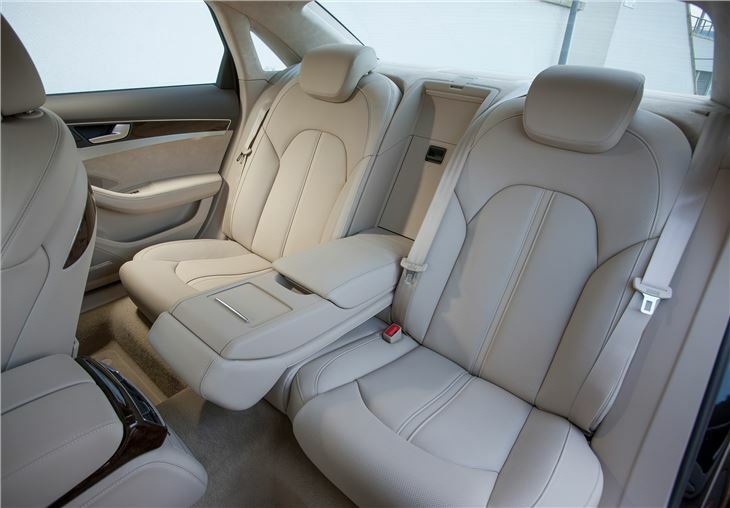 As with the exterior, the basic architecture stays the same, but there are subtle improvements throughout, including a wider choice of leathers, woods and colours. 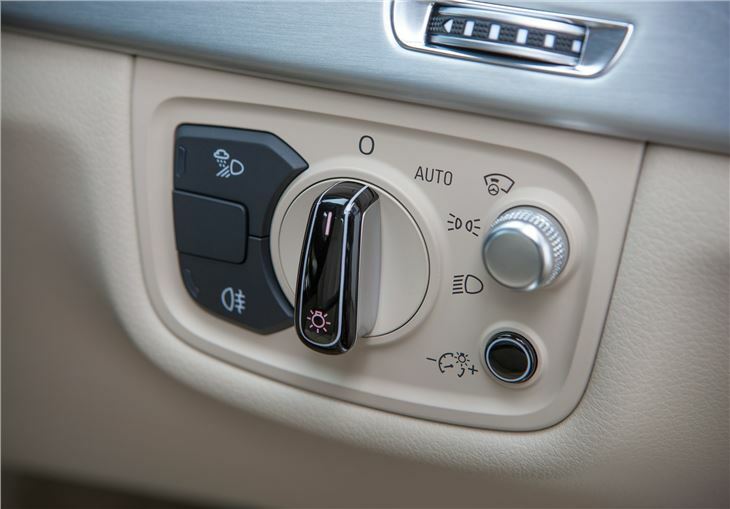 You’ll also now find a park assist system with 360 degree display that handles the steering when parking plus a head-up display which projects important data onto the windscreen. In addition, the night vision will also recognise large animals, as well as pedestrians. 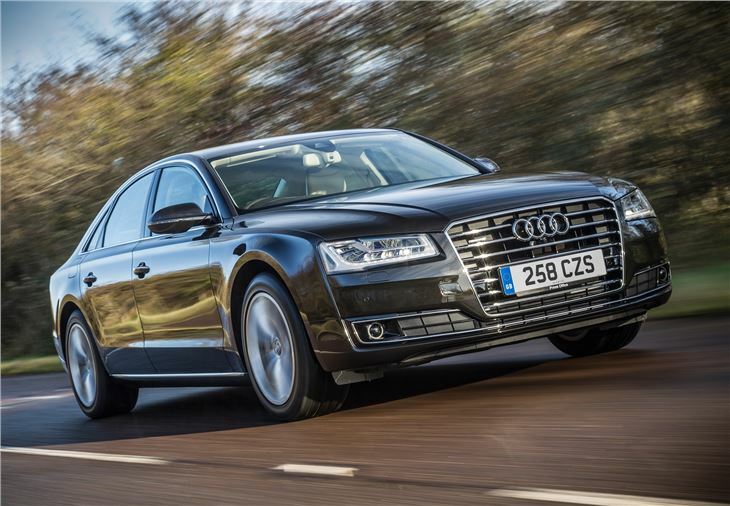 The rest of the facelift deals with making the A8 a better on-paper proposition. The big seller, the 3.0-litre TDI quattro sees emissions fall from 169g/km CO2 to 155g/km. Private buyers are likely to shrug at that news as it does little to improve running costs. 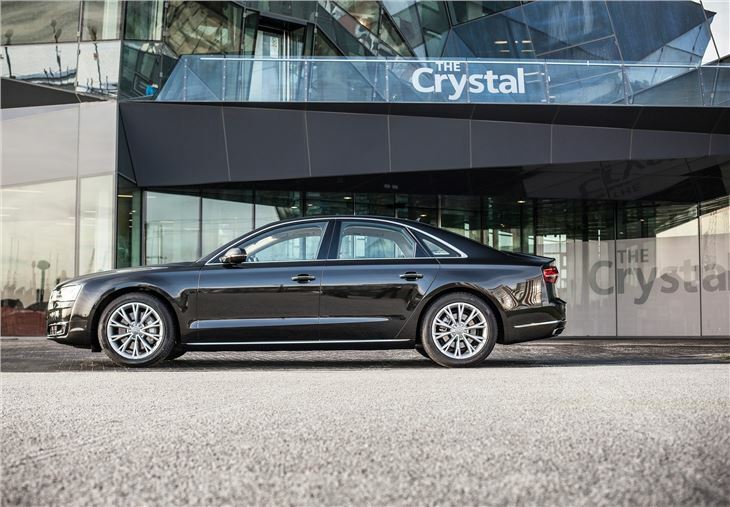 It's a much bigger deal for those who run an A8 as a company car. 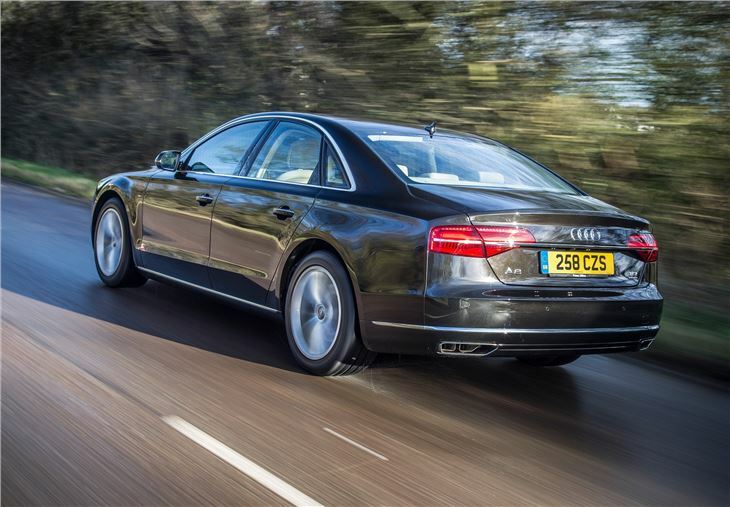 That 14g/km drop for the 3.0-litre diesel not only nudges the car down two BIK brackets (it's now 27 per cent), but also gets it under the 160g/km Capital Allowances barrier. 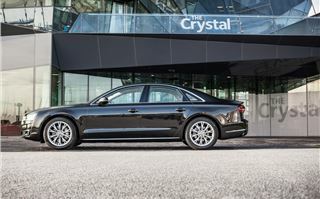 It's some drop and one that brings it under what even the old front-wheel drive A8 3.0-litre TDI was achieving (all A8s are now quattro), but the A8 has been playing catch-up to improved offerings from BMW and Mercedes-Benz. 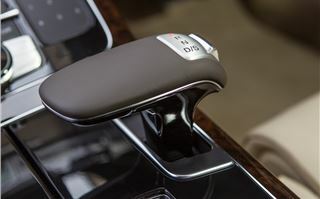 The 730d, for example, is 148g/km and has a 25 per cent BIK liability, while the Mercedes-Benz S350 BlueTec is 146g/km with 25 per cent BIK. 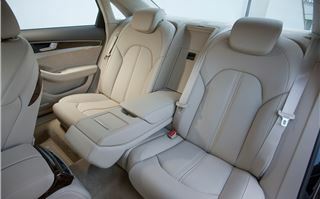 That said, the Mercedes-Benz is likely to set you back £4380 more, while the BMW is similarly priced to the A8. 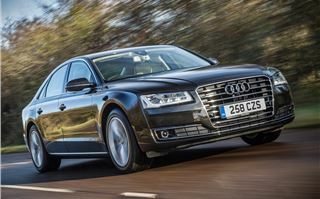 It's a similar story with power and Audi has not only been able to make the facelifted A8 cleaner, it has given it more punch. 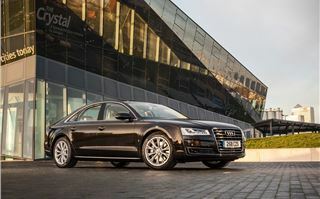 The 3.0-litre TDI A8 is now 8PS more powerful, so it now comes in at 258PS, which matches what's on offer from equivalent BMW and Mercedes-Benz offerings. 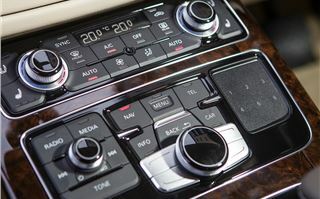 Other engines benefit from similar improvements, with the 3.0-litre TFSI 20PS more powerful and 21g/km more efficient (now 183g/km, a 10 per cent improvement); the 4.0-litre TFSI now 15PS more powerful and 6g/km cleaner (now 221 g/km) and the 4.2-litre TDI now 35PS more powerful and 1g/km cleaner. 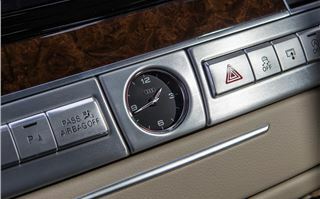 You won’t find that these changes have altered the driving experience at all, not that it was an area in need of attention. 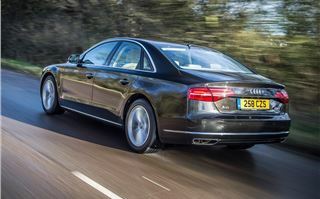 It remains smooth, quiet and refined, which is particularly welcome on the motorway, yet the light aluminium body means it feels far nimbler than other cars of this size on back rounds. 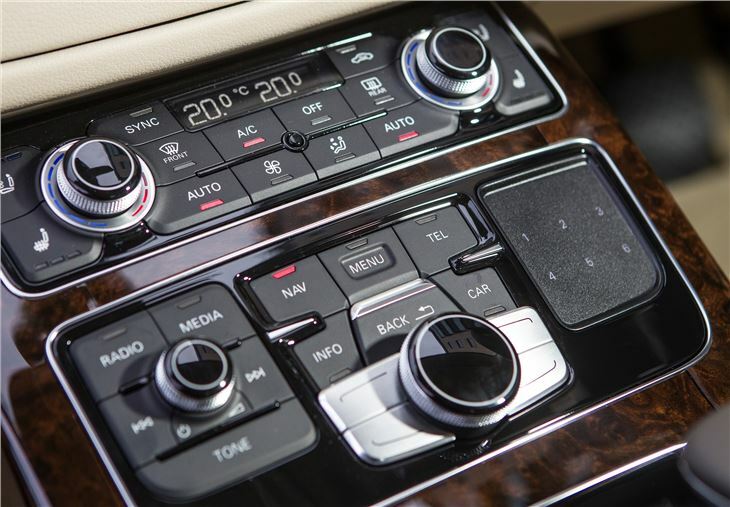 The standard eight-speed gearbox is particularly impressive, offering barely-noticeable changes even under heavy acceleration. 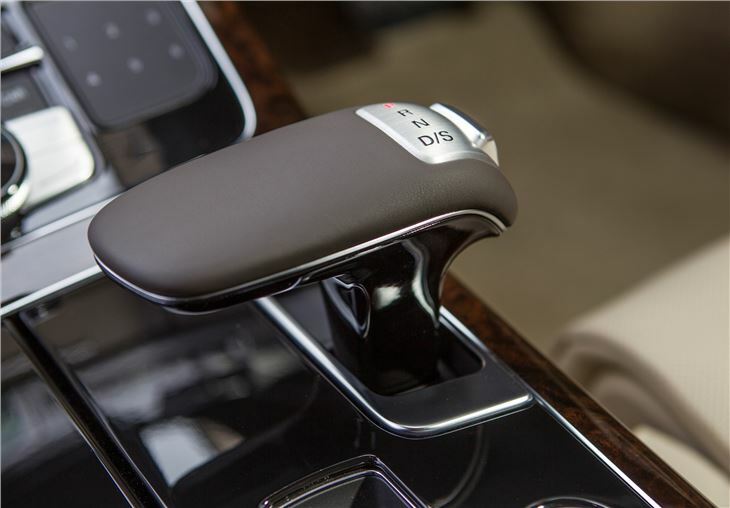 Body control is excellent, with flat cornering and the standard adaptive suspension gives a great ride over all but the roughest of surfaces. 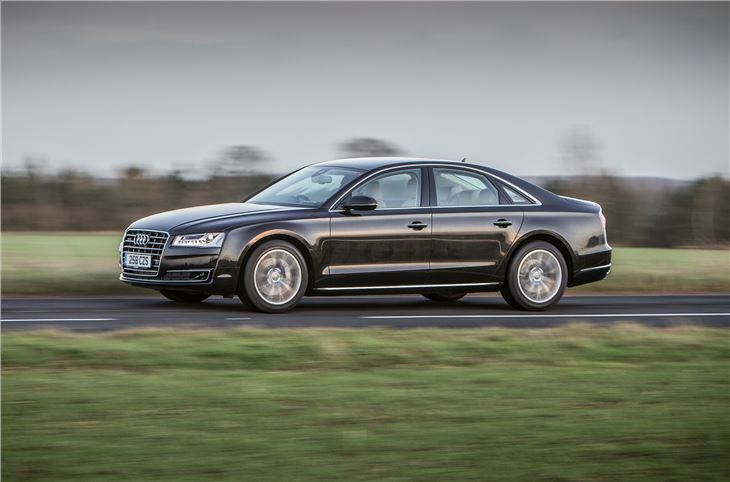 As a luxury saloon the A8 is still as good as ever. 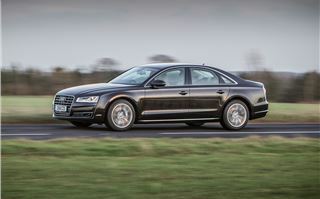 The revised A8 is available now, priced from £58,800.